After a childhood marked by war, Samuel Fosso opened a photo studio in Bangui, in the Central African Republic, shooting self-portraits on film left over from commissions. Le Chef is one of a series made for the Tati clothes shops in Paris, in which the artist adopts different identities. The excess of the image is not a matter of narcissism but of collective critical self-reflection. Fosso here plays on clichéd Western representations of African potentates while evoking too the latter’s role in the slave trade. 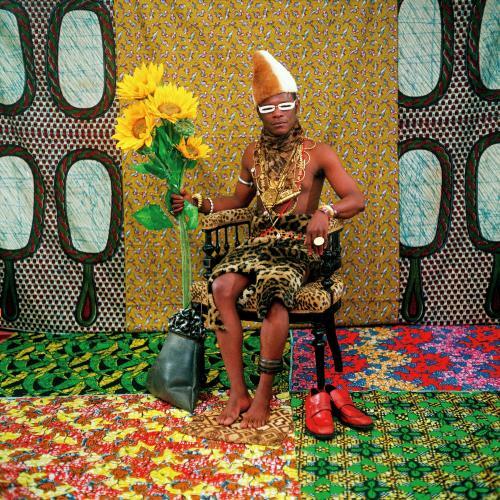 Wearing the royal headdress affected by Congolese dictator Mobutu, Fosso radically transforms the function of the self-portrait.